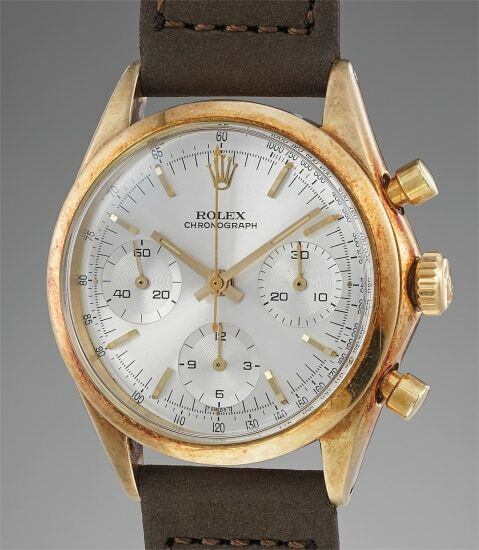 Known as the "Pre-Daytona", reference 6238 was the very last chronograph model that Rolex produced following the introduction of the Cosmograph in 1963. This particular model was produced during the very last years of the reference's production period. The date of manufacture most notably overlaps with the production period of reference 6239. Cased in 14K yellow gold, this reference 6238 is presented in impressive condition. A thick layer of multi-colored patina has developed throughout the case, demonstrating how the watch has seen very little intervention throughout its lifetime. Two hallmarks are visible and crisp beneath the lugs. The movement is stamped "ROW", indicating export to the American market, which is fitting as the watch is cased in 14K yellow gold. This particular dial has been preserved in incredible condition and displays round, luminous dots that have aged evenly with the hands.